All parts of the body require a constant supply of blood in order to receive oxygen, nutrients and other materials required to keep its cells alive. Since blood needs to be pumped through the arteries by the heart, the amount of force this applies on the blood vessels is known as blood pressure. Blood pressure is not constant, but changes depending on whether or not the heart is filling with blood (diastole) or contracting and pumping blood into the arteries (systole). Pressure in the arteries is at its lowest during diastole and highest at systole. Blood pressure is usually measured using the format: systolic pressure/diastolic pressure, with the units “mmHg”. Normal blood pressure for adults is around 120/80 mmHg, although this can vary depending on age and gender. 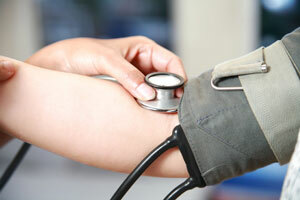 Abnormal blood pressure can lead to serious health problems, both in the short term (acute) and long term (chronic). Chronic high blood pressure is known as hypertension and has been linked to increased risk of stroke, heart attack and other serious disorders. Low blood pressure (hypotension) can lead to serious, immediate health concerns and even death. Hypertension can be caused by an inactive lifestyle, unhealthy diet (including foods with high sodium and fat), alcohol use, smoking, genetics, and other factors. Hypotension is usually caused by more immediate factors such as dehydration, blood loss, allergic reaction, and serious infections. It is very important for adults to have their blood pressure monitored by a doctor regularly and take steps to keep it at normal levels in order to live a healthy life. Hypertension can be treated through lifestyle changes and by several different types of prescription drugs. Exercising more and losing weight are simple ways to naturally lower blood pressure. Decreasing the intake of foods that are high in sodium and fat, decreasing alcohol consumption and quitting smoking are also ways to decrease blood pressure. Living a healthier lifestyle will decrease harmful cholesterol (LDL), raise healthy cholesterol (HDL) and generally keep the heart and body more healthy. One can also help manage hypertension by reducing their amount of daily stress through a variety of relaxation techniques. Diuretic drugs can be used to decrease blood pressure by reducing the amount of fluids in the body (reducing the pressure on the blood vessels). Drugs that block a molecule known as angiotensin can lower blood pressure by keeping this molecule from constricting the blood vessels, which decreases the amount of force on them. Other drugs which cause blood vessels to relax include: vasodilators, calcium channel blockers and alpha blockers. Beta blockers are drugs that act on the heart to reduce the amount of force in which the heart beats, thereby reducing blood pressure. Often many of these different treatments are used in combination with each other in order to maintain a healthy blood pressure. Hypotension is not as common as hypertension but it can be a serious health concern, which requires treatment. A sudden drop in blood pressure is an immediate and serious problem that requires the cause of the low blood pressure (eg. bleeding, dehydration) to be treated, usually through hospitalization. Long-term or chronic hypotension is rare but can be treated by changing any medications that lower blood pressure, being more hydrated and increasing salt intake. Next articleIs Antibiotic Use in Infancy Linked to Childhood Obesity?